This guide will show you how to display a form on a non-WordPress page using the HTML iframe element. You will need to create a blank Page template in WordPress, to do that make a copy of the page.php file from your theme and call it template-blank-page.php. 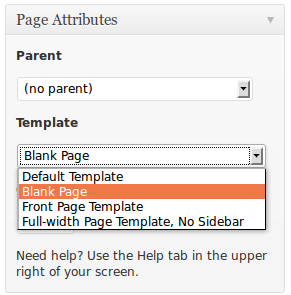 In this example we will create a page template based on the TwentyTwelve theme included with WordPress. I’ve copied everything from the start of the header.php down to and including the <body> tag, and the last three lines of the footer.php file, and put the code to display the page content in the middle. Then the comment at the top of the file was modified to declare that this file is a page template which enables it to be selected when editing a page in WordPress. The next step is to create a page inside WordPress and select the “Blank Page” page template on the right hand side of the page. Add the form shortcode to the page. Save the page and find the URL of the page, which you can do by right clicking the “View Page” link and selecting “Copy link location” or similar.